Now that the apple harvest has been completed or is nearing its end in many parts of Europe, the initial prospects have been adjusted. Prognosfruit's first estimates from August, which predicted a European harvest totaling 12.6 million tons, have been adjusted to 12.5 million tons. Although the warm summer and persistent dry weather resulted in challenges for the growers, the harvest arrived all the same. Traders speak about a quality harvest. The color and taste are described with various superlatives. The apple season started a bit earlier than normal, but not as early as anticipated. The harvest kicked off in August and will be completed this month. "This season has been more compact than previous ones thanks to the hot summer. We had 94 days without significant rain, which made things difficult for growers who could not irrigate," says a trader. Due to the heat, the volume has been reduced. "A big plus is that we are harvesting the best fruit in years thanks to this weather." With this, the trader is referring to the fruit’s taste and coloring. The last batches of the old harvest were sold in the spring, so the transition between seasons did not go smoothly. Now traders see an overlap between the overseas season and the domestic season. This results in heavily discounted apples on the shelves. "British apples always get a good place on the shelves and many Brits are loyal to British products." At the moment, the last Granny Smith apples are being harvested. For the other varieties (Golden, Red Delicious, Gala etc. ), the harvest is as good as finished. According to a grower in Girona, an important production area in Spain, the production volume is smaller than last year’s. The same applies to Lleida. The harvest of the Golden, the most cultivated variety in Spain, has been the smallest in ten years. Moreover, the warehouses are empty. According to this grower and exporter, less fruit will be available than what was forecast by Prognosfruit. He also points out that China, for example, expects a smaller harvest. "Some European retailers are using the Prognosfruit figures to put prices under pressure, but it is still too early to see if this is going to be the trend. The season has only just begun and there is a lot of uncertainty. It is a difficult year to make predictions." The figures from Prognosfruit confirm that the harvest in Italy has reached the levels predicted at the beginning of August. In general, the quality, size and coloring are good, which is the result of good weather during the harvest. Hail fell in a number of regions; thus, greater volumes will likely go to the processing industry. The season is starting in the coming days, but traders are already busy making preparations. During the presentation of Interpoma 2018, discussions were held, among other things, about the growing popularity of organic apples for both the fresh market and the industry. More and more hectares are being converted, especially in Alto Adige, but they are still looking for the right varieties. "After two years with lower yields due to extreme weather, we have a normal harvest with average volumes this year." The first Gala hit the market early in September and was then followed by other varieties like the Red Delicious, Golden Delicious, Pinova and Kanzi. The Envy closed the harvest season in November. The sale of the Red Delicious started in week 39, followed a week later by the Golden and Kanzi. In the middle of October it was the turn of the first Ambrosia. "We expect good and above average sizes for the Golden and Red Delicious, which should allow us to offer a continuous supply to the Italian and Spanish markets." The supply of organic apples is also back to a normal level after two difficult years. Sales started at the end of August with the first Gala. Those apples will be available until August next year. Also, 200 tons of organic Ambrosia are expected and will be available between mid-October and mid-December. This volume will increase further in the coming years. The Bonita bio is a new variety (cross between Cripps Pink and Topaz) for which a harvest of 200 tons is expected. This apple is on the market between January and April and is mainly intended for export to Germany and Northern Europe. An organic Kanzi is also available. The harvest stands at 1,000 tons. In the next three years, that production will rise to 2,000 to 2,500 tons. Exporters are trying to reach new markets outside of Europe. Hong Kong, Malaysia and Singapore are mentioned as markets that mostly demand sweet apples. Brazil is an interesting market, because organic cultivation is not possible there. The country demands Gala, Red Delicious, Golden and Fuji apples. Lastly, Israel and the United Arab Emirates are also mentioned as attractive markets. The cooperative expects a harvest totaling 550,000 tons for all its members. That is 17% more than last year, but not as much as the 600,000 tons achieved in the record year 2016. The harvest started in the second week of August with the first Gala. The apples grew well in the spring, but their growth slowed down during the warm weeks of July and August. The sizes are average. Meanwhile, the organic production stands at 22,000 tons, which is 48% more than in 2017. The organic supply consists of Gala, Braeburn, Pinova / Evelina and Cripps Pink / Pink Lady apples. At Melinda, the season started as always with the Gala, followed by the Renetta Canada, Red Delicious and Golden Delicious. Then it was time for the Evelina and the Fuji. Just as expected, 460,000 tons of apples have been harvested in Trentino, 400,000 of which in Val di Non and Val di Sole. Three Italian companies have joined forces and presented a joint venture for the exclusive export to Asia. Rivoira, RK Growers and V.I.P Van Venosta are targeting the Asian market under the Omnifresh label, namely Hong Kong, Singapore, Malaysia, Indonesia, China, Vietnam, Taiwan, Thailand, Korea and Japan. So far, access has been gained to Hong Kong, Singapore and Malaysia. It is hoped that Taiwan and Vietnam will also soon open their borders. In France, a lot of fruit has been harvested. There is a huge supply at the moment, because many varieties were ripe early due to the heat of the past few months. These apples have a limited shelf life and this is putting some pressure on the market. A trader expects the situation to improve soon. "The production of the classic varieties has been low. This will have a positive impact on prices." What is most striking in the French apple sector is the trend towards organic cultivation and club varieties. The largest apple cooperatives in the country have been working for years to try increasing their production on both fronts. "There is a lot of demand for club varieties. They also entail fewer financial risks, because production is limited," says an exporter. The apple harvest in Northern Germany is about to come to a close. By the end of week 43, the last batches will have been picked. As in most parts of Europe, Germany has had a good harvest with large volumes. The club varieties Junami and Kanzi have also been harvested and the quality is good. Only the Elstar is somewhat behind, with a slightly under-sized harvest (-25%) and moderate fruit sizes. In any case, domestic product sales are extremely difficult at the moment. The German retail sector is purchasing only limited volumes, to the detriment of producers and wholesalers. In the south of Germany, on Lake Constance, the summer temperatures were even higher this year. This has had an impact on the shelf life of the apples. In order to prevent that a large part of the harvest fails to reach the market, traders are being very flexible with their prices. Moreover, German traders also have their eyes set on Poland and South Tyrol, which is putting even more pressure on prices. For the time being, however, the German market is still largely supplied with domestic apples. In the Netherlands, the apple harvest is almost complete and most of the fruit is already in chambers. Consequently, the pressure is already off the market. Unlike the pear production, the apples are mainly intended for the domestic market. Traders say that supermarkets are organizing good campaigns with the Dutch apples. Prices remain at a stable to slightly rising level. For example, the Elstar - the most popular apple variety in the Netherlands - is sold for 60/70 cents (75-grading). The price of the Jonagold oscillates between 50 and 60 cents, although the export of the large sizes is somewhat more difficult. The country expects a decrease of 15% compared to the original estimate of 128,000 tons. The harvest has been affected by the persistent dry weather and high temperatures recorded since April. As a result, the fruit is smaller and more will be delivered to the industry. Polish growers have had a good harvest. According to a trader, the apples are sweeter and slightly smaller than usual. These are two favorable qualities to export to China, he explains. "That is why we should probably focus on the Asian market, since Europe does not demand as many apples as it used to." Closer to home, an exporter also sees opportunities in the Middle East and North Africa. The Polish government is considering the withdrawal of 500,000 tons of apples from the market at a fixed price in order to alleviate the situation of the growers. The measure has not been enforced yet, but according to traders, it could help in the short term. According to reports, the prices of industrial apples have fallen sharply in Russia. The domestic harvest is still underway and the supply of industrial apples from Belarus has increased. As a result, prices are falling almost daily. At the beginning of week 41, the price was 0.12 dollars per kilo. By the end of the week, the price was 2 to 3 cents lower. Currently, the industry is no longer buying apples for more than $ 0.09 per kilo. Local growers respond faster to price changes. Small growers have stopped harvesting because of the low prices paid. According to a grower, selling the product is not profitable if the orchard’s maintenance and the cultivation costs are higher than the fruit’s price. That is why the late varieties are not harvested by many small growers. These growers don’t generally have access to a cold store and therefore have to sell their apples directly at origin. According to reports, the costs for picking and transporting the apples are about the same as the prices currently offered. Payments, however, take a few months to clear, because there is no direct payment. Better news for the Ukrainian sector is the message that India is opening its borders to the country’s apples. India is already the most important export market for Ukraine. Access to the Indian market will further increase those exports. Traders predict that India will replace the Russian market, formerly the most important export market. Thanks to the beautiful summer weather, the harvest has been large, resulting in lack of space in the cold rooms. Only the best quality will be marketed. In the Thurgau region, the harvest is so large that more will be supplied to the (cider) industry. This year’s figures are in stark contrast with those of 2017, when the harvest turned out small. Different states have different prospects for the season. A slightly larger harvest is expected in New York. A grower reports that "we definitely have more apples for consumers. It's a nice harvest. The coloring is good and the sizes are normal. "Growers in the state mainly cultivate the Empire, McIntosh, Cortland, Delicious, Gala, Fuji, Honeycrisp, Snapdragon and Rubyfrost. "In general, the yields for all these varieties are in line with our expectations." Last year, the area was hit by hail, which meant the harvest was smaller. This year, the yield is good, although the harvest in the west of the state has been delayed by 5 to 7 days, because growers are waiting for the right coloring. The last apples will be picked in the first week of November. A smaller crop is expected in Washington, but the quality should be good. The latest estimates show a slight decrease. The previous estimate of 131 million boxes has been adjusted downwards to 116.8 million boxes. However, there is a shift from old varieties to new varieties. The most popular ones in Washington are currently the Gala (24%), Red Delicious (21%), Fuji (13%), Granny Smith (13%), Honeycrisp (11%) and Pink Lady / Cripps Pink (4%). The acreage devoted to the Golden and Red Delicious is under pressure. The Red Delicious, the most cultivated variety in the state for decades, surrendered its leading position to the Gala. In Michigan, the harvest is larger than last year’s, but smaller than expected. The SweeTango, Royal Gala, McIntosh, Jonagold and Honeycrisp were harvested at the beginning of the month. A short time later followed the Golden Delicious and Red Delicious, followed by the later varieties, including the Kanzi, Kiku, Fuji and Evercrisp. The weather in the state triggered changes in the harvest periods. Some regions started earlier than normal. In other areas, there was a lot of rain two to three weeks before the harvest. Due to the warm summer, the demand dropped in these months. September was still warm and the supply of stone fruit was still good. However, the market picked up in October. When it comes to exports, the sector is concerned about trade barriers. India recently introduced counter-sanctions with increased tariffs for apples. 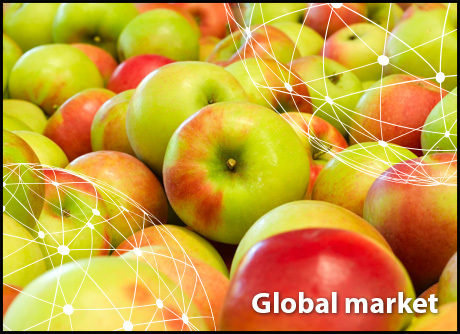 The new Apple and Pear Industry Strategy 2018-2023 describes changes in the supply chain for the top fruit. With the premium brands and the new export markets (especially the Chinese market) the sector sees a lot of potential for the apples. For the year ending in June 2017, 319,686 tons of apples were harvested, 29% of which went to the industry. Australia exported 4,950 tons, which was a slight increase compared to a year earlier. A quarter of the exports had the United Kingdom as their destination. Although new varieties are being introduced, the Pink Lady (37%), Gala (23%) and Granny Smith (20%) are still the top three in production. The government is looking at the possible risks of importing apples from the northwest of the US (Oregon, Idaho and Washington). A first version of a protocol is expected for March 2019. This year the apple output of China is affected by extreme weather which caused a much lower output compared to former years. In the apple production areas Shaanxi, Gansu, and Shanxi the production volume decreased by an estimated 20% to 50%. Late-season apples are being harvested now and because of the low output, some areas end the harvesting period much earlier than they normally do. Even though the output of this year decreased a lot, the prices of apples are increasing. The current price of apples continues to increase.The actual price increase of course depends on differences in product variety and production area, but generally speaking, the price of apples increased by at least 40% in comparison with the same period in the previous year. The price of some apple varieties even increased by 100%, such as the Qinguan apples from Shaanxi. This is good for the companies selling to the domestic market, however, for the ones selling to the export market it is not. The apple prices are much higher now and that makes it harder to compete with other countries. For export China faces two more problems, in America, tariffs are still imposed on importing Chinese apples and in India, the Indian government did not lift the ban on the import of Chinese apples. Those two are important export destinations for Chinese apples. However, Chinese export companies managed to find other destinations for their export, so they can still sell their supply.